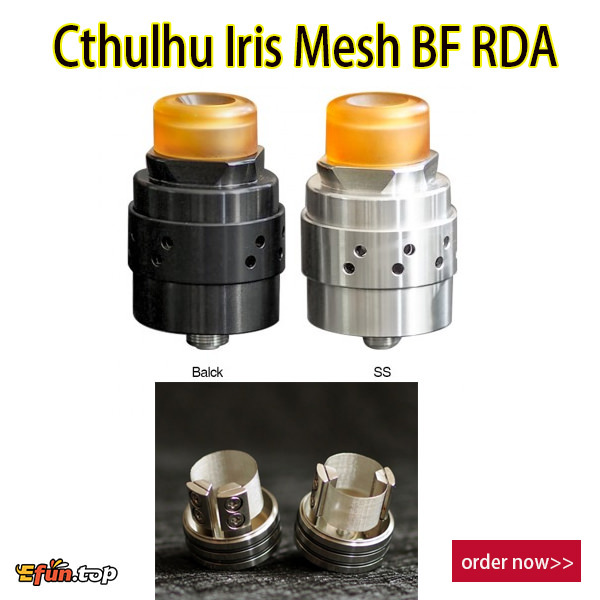 The Iris Mesh RDA from Cthulhu is a newly designed unique dual coil Mesh RDA which supports single and dual mesh coil to bring an excellent vaping with optimal flavor and huge vapor. The Iris Mesh RDA features an innovative and changeable vertical post build deck for easy single or dual mesh coil building and making the wick pull away from the mesh without dry burning. Moreover, the Mesh RDA comes with a unique adjustable airflow control with many air holes to provide precise airflow intake. Together with an efficient BF pin, two kinds of drip tips and two pieces 300 Mesh pad, the Cthulhu Iris Mesh is perfectly compatible with Squonk MODs and brings amazing vaping for vapers! Good choice for Mesh tank lovers!